I'm sitting inside watching the rain pitter-patter against my window, and I think it's safe to say, that over the next few weeks months, going outside with bare arms and bare legs is about as likely as Boris Johnson changing his haircut. Although temperatures are noticeably becoming cooler, it's still early days for a full on winter coat. My most wanted item for this season? 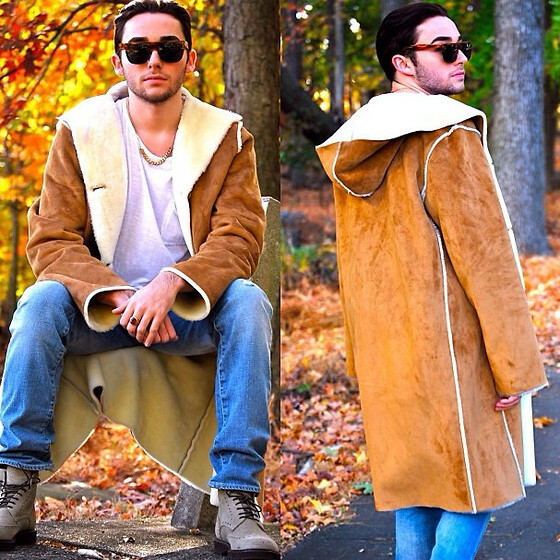 A shearling jacket. Remember the aviator coat 'boom' of a few years back? You'd have been hard pressed to find a magazine that didn't feature one. Soft buttery leather with a hint of shearling around the sleeves and collar. As with most trends, I buckled and bought myself one. Although I stupidly succumbed to vanity sizing - where you order clothing in a smaller size even though that deep down you know that you require the size up - so my jacket wasn't a great fit. With this sort of jacket you need to size up - think layering in colder weather. If you can fit a couple of jumpers underneath with ease, then that's your jacket right there. You can read my guide on how to layer like a pro here. Will you be investing in a shearling jacket this season? I love this style jacket - so perfect for winter!